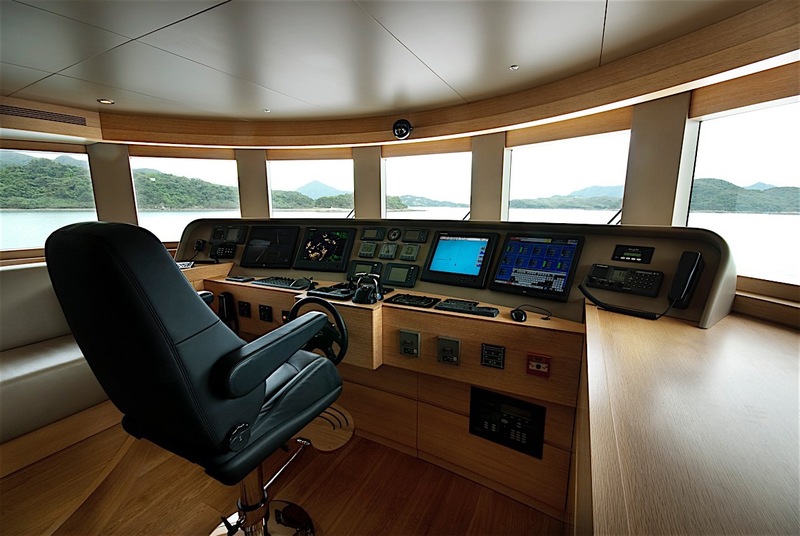 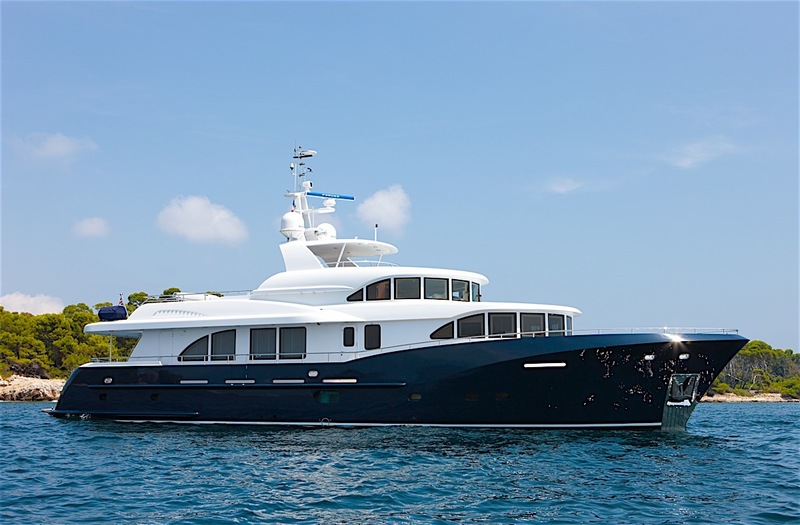 Motor Yacht Belle Isle is an elegant and outstanding Columbus 90 luxury explorer style yacht as built by the Hong Kong superyacht builder Kingship. 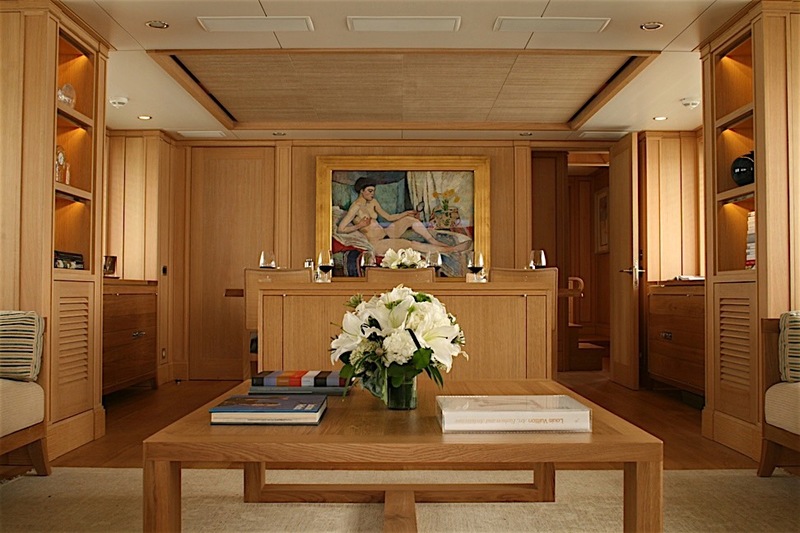 Following the traditional New England look, the charter yacht Belle Isle features clean and uncluttered interior by Angus Addison, incorporating luxurious silk lined ceilings, beautifully polished stainless steel and excellent attention to detail; taking her charter guests back to the grand age of yacht voyage. 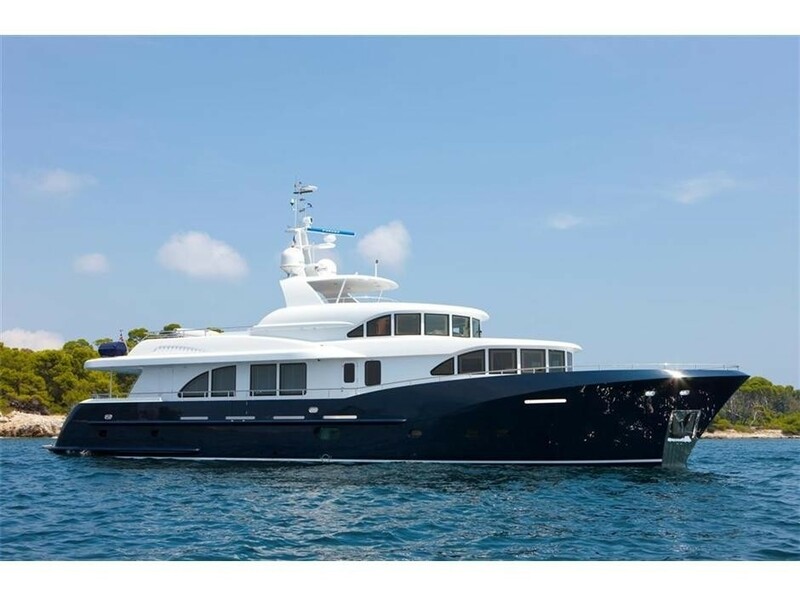 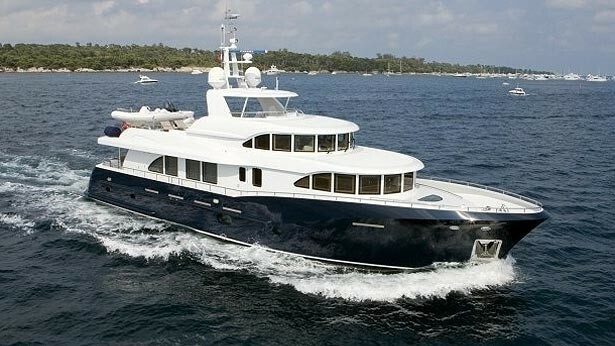 Designed and engineered by Vripack and built at Kingship's Zhogshan yard, the Columbus 90 superyacht BELLE ISLE measures 83 feet in the water line. 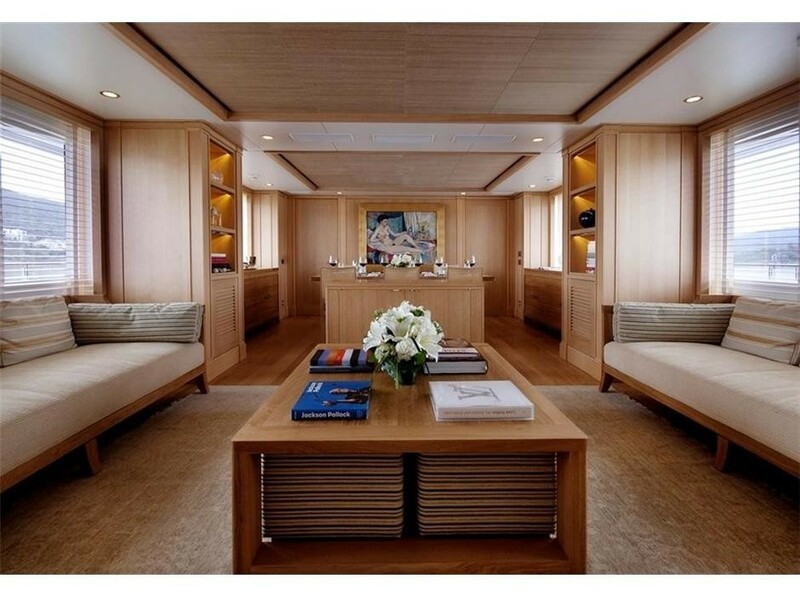 All the interior woodwork is created of natural-coloured oak, with a great amount of solid wood used in the construction of her cabinetry. 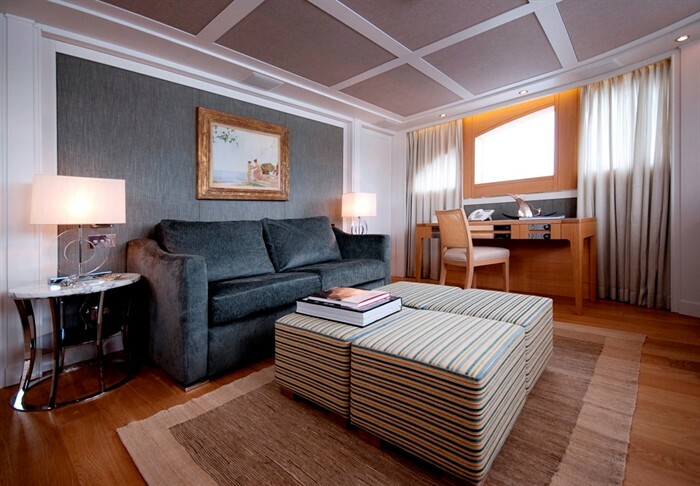 Walls, floors and furniture are all made in a similar finish, providing Belle Isle with a clean, uncluttered holiday feel and an illusion of space. 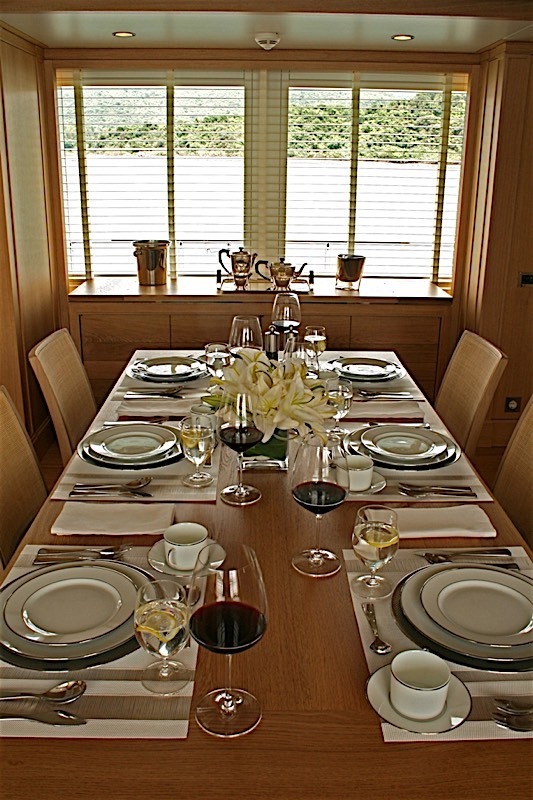 Dining room is divided from the saloon area thanks to a small cabinet with a retractable television, separating the area without ruining the open sight lines. 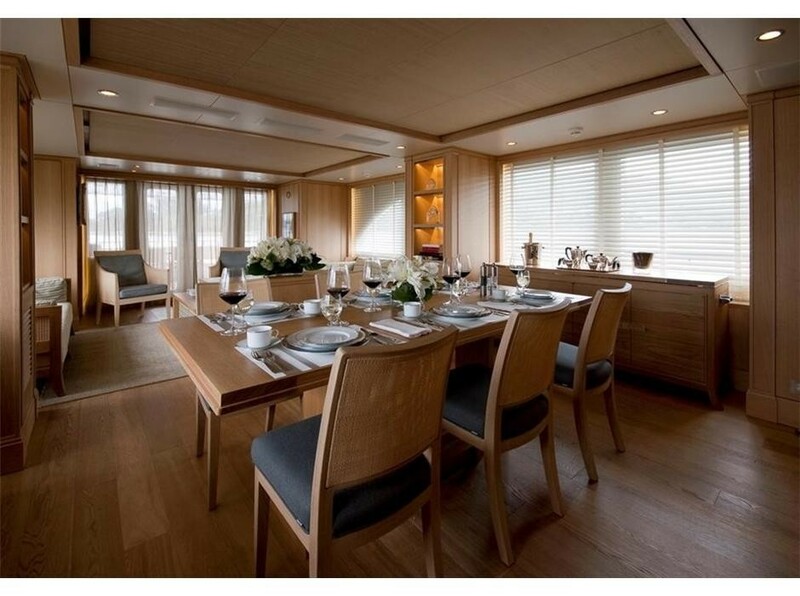 The dining area has sideboards on both sides, with subtle polished stainless steel accents that compliment the simple design. 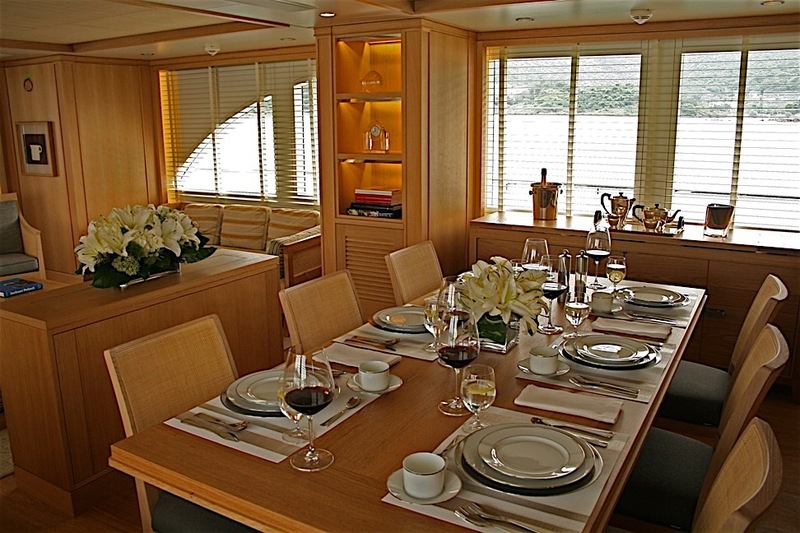 Galley aboard Belle Isle can be found on the port side off the dining room. 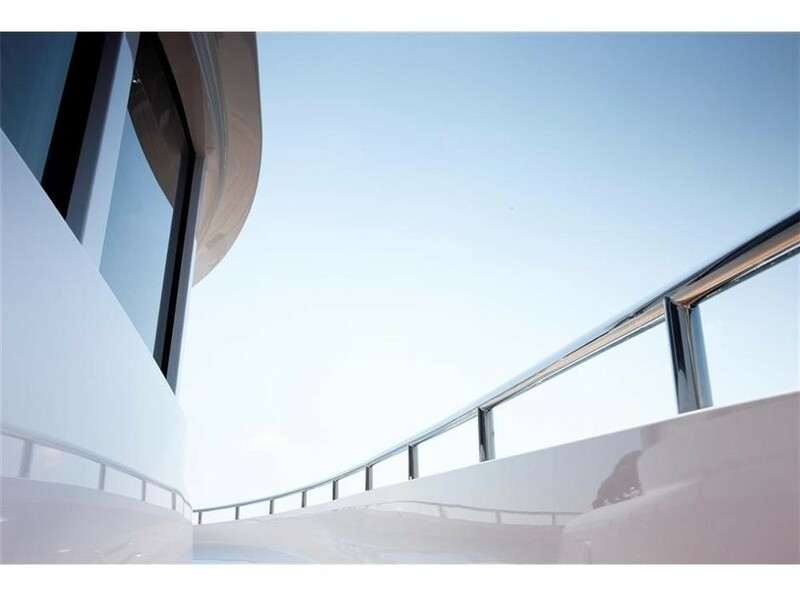 A small day head is located to starboard and forward, where stairs, doors and companionways meet. 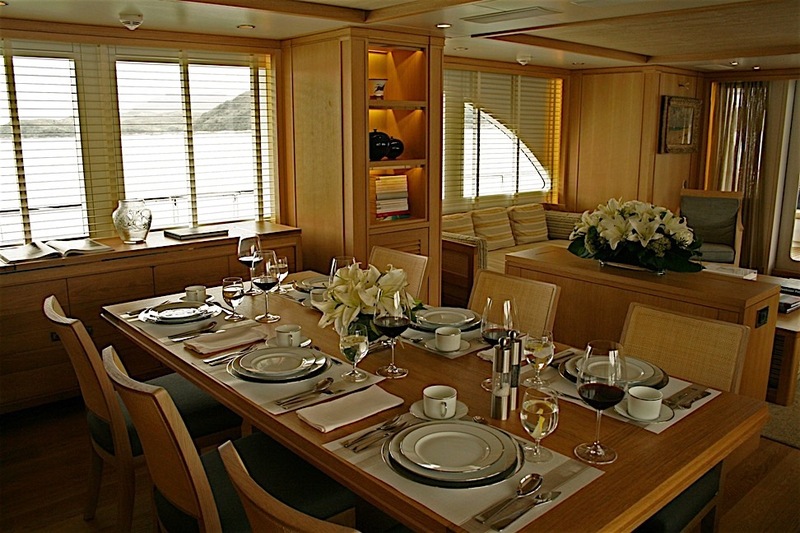 Here the Columbus 90 once again provides more space than expected. 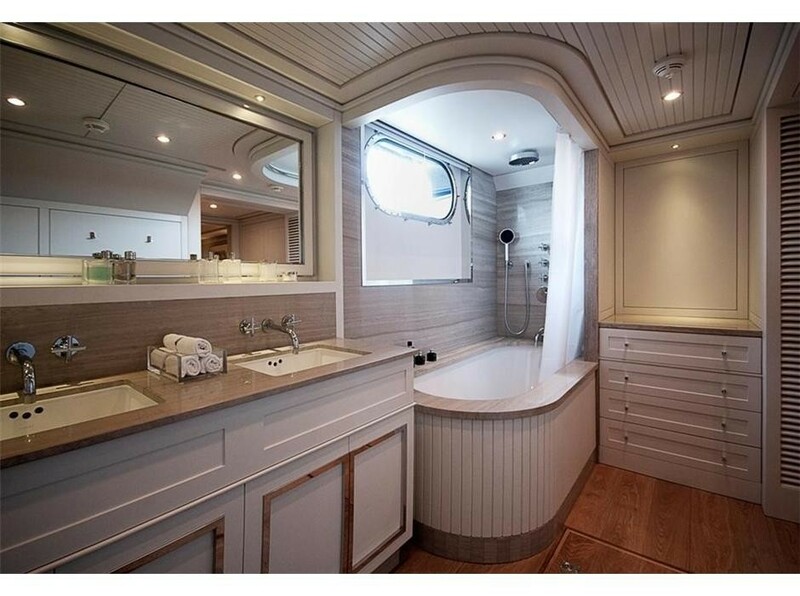 Some of the most important features of the yacht are the main stateroom and the adjoining spa bath. 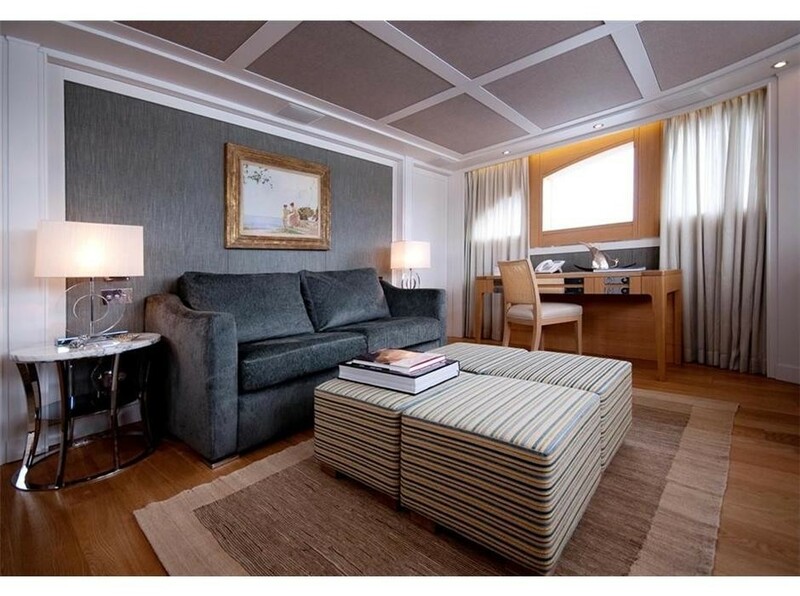 All-around windows provide excellent view and the green linen-lined ceilings and walls help to warm up the space. 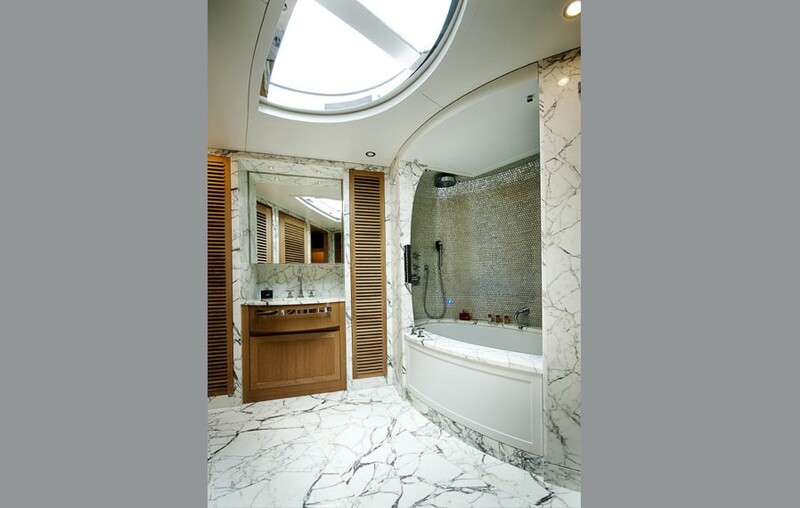 A few steps below, into the bow guests can find a large and luxurious spa bath, including a tiled tub and 'his & her' vanities, featuring Arabasco marble and a large skylight. 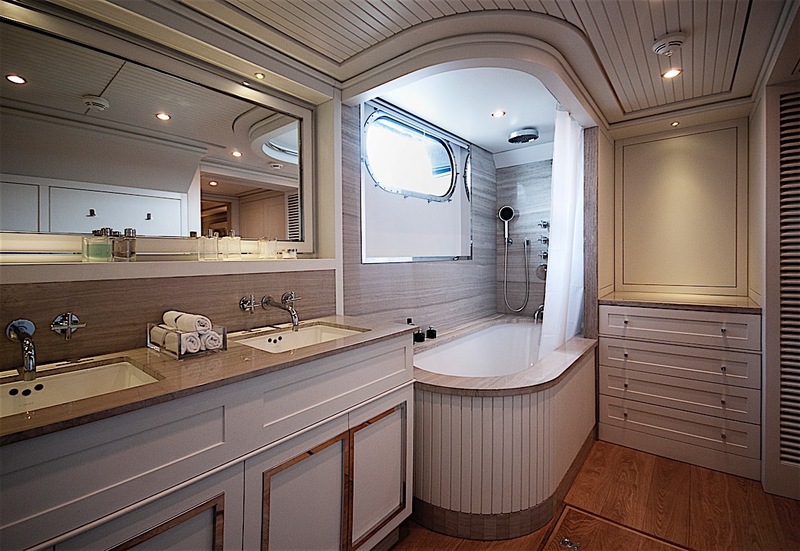 The full-beam VIP cabin is located on the lower deck, with a muted, natural colour scheme of greys and tans, and features a roomy en-suite with his and her vanities and a bathtub. 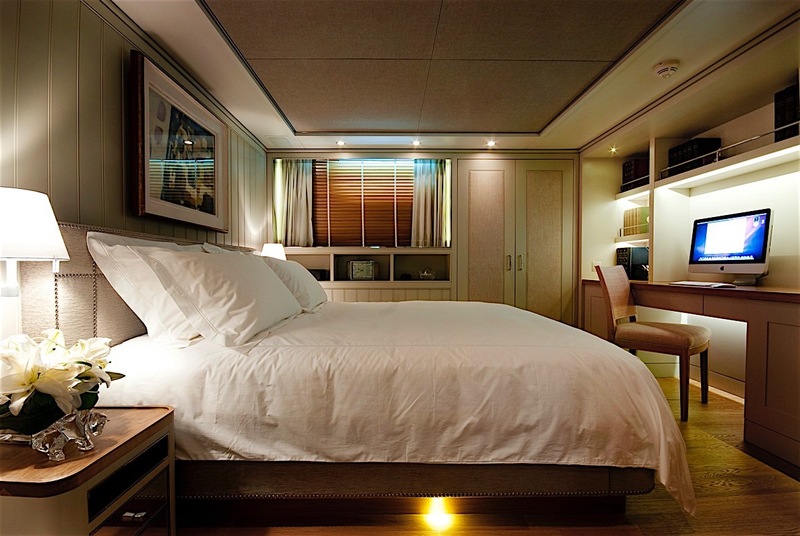 Two additional twin cabins, with two twin bunks, are located forward of the VIP cabins. 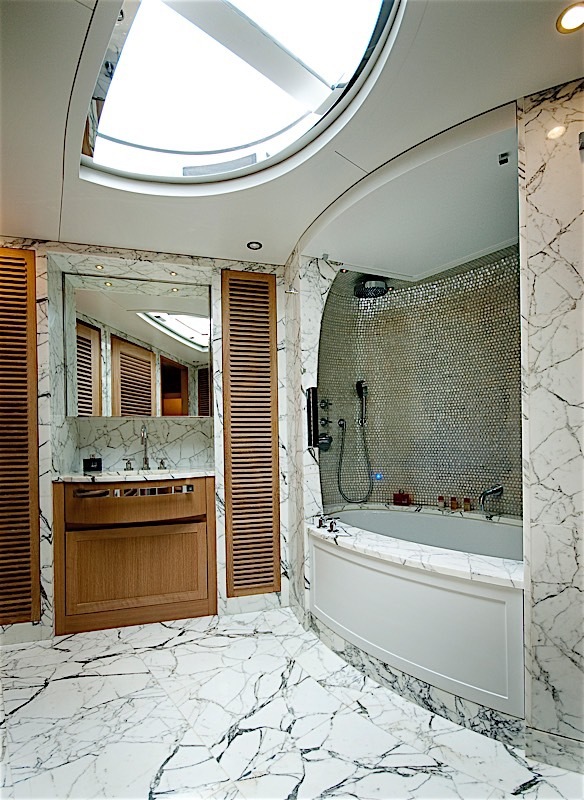 Both of the cabins boast en-suite heads finished in Chinese marble. 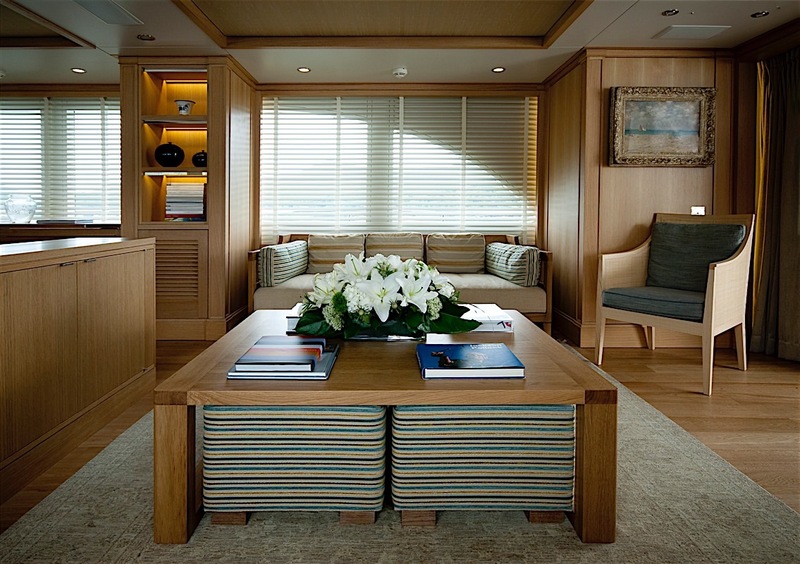 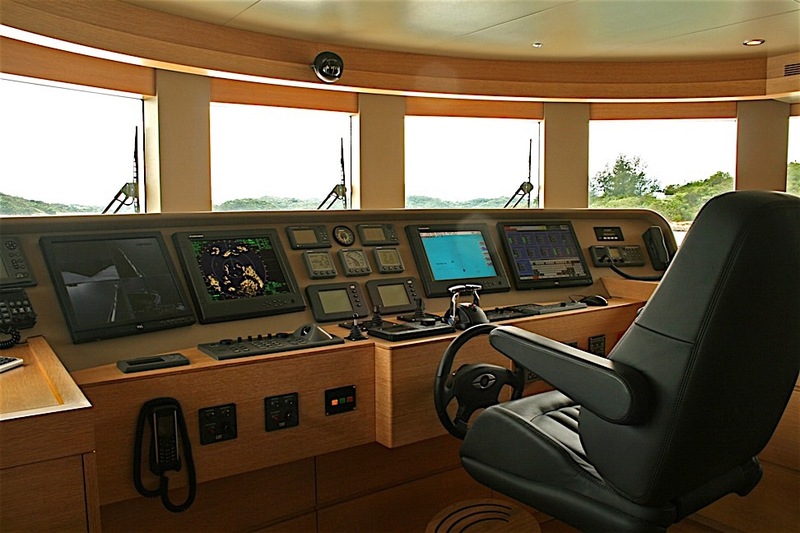 The crew quarters aboard explorer yacht Belle Isle can be found at the aft end of the lower deck, located just forward of the engine room and next to the laundry facilities. 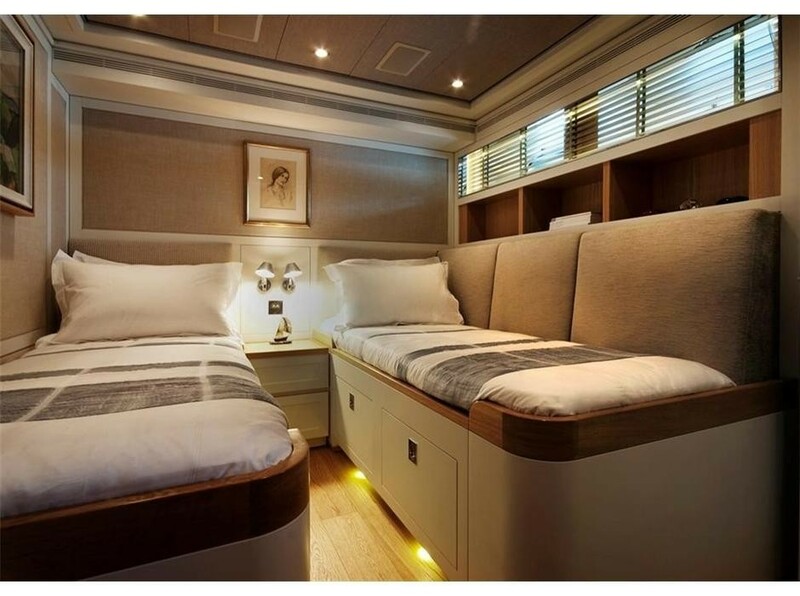 There is also a spacious captain's cabin with en-suite and a second crew cabin with two twin bunks, also with an en-suite. 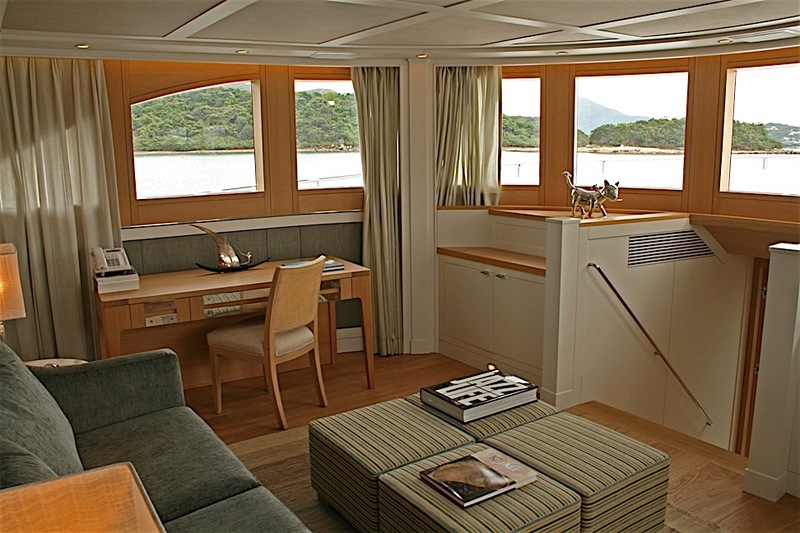 The quarters also feature a small galley and a dining area. 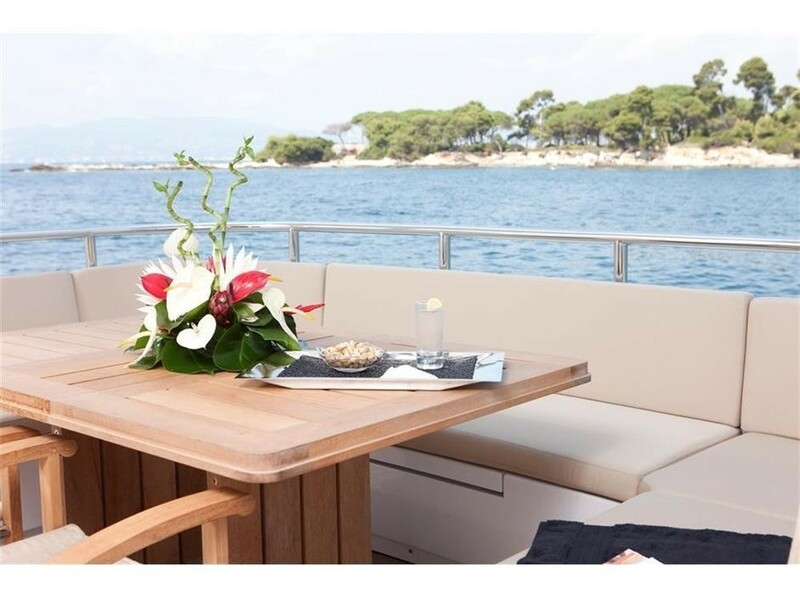 The sun deck area features a small seating area and a table, perfect for relaxations in privacy. 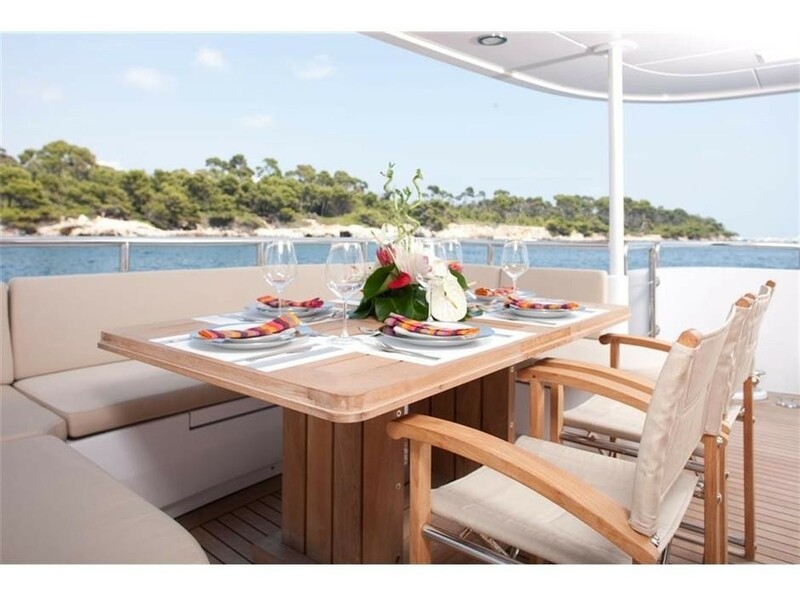 The large top deck of Belle Isle can be easily transformed from a day-time play area to an elegant alfresco dining space. 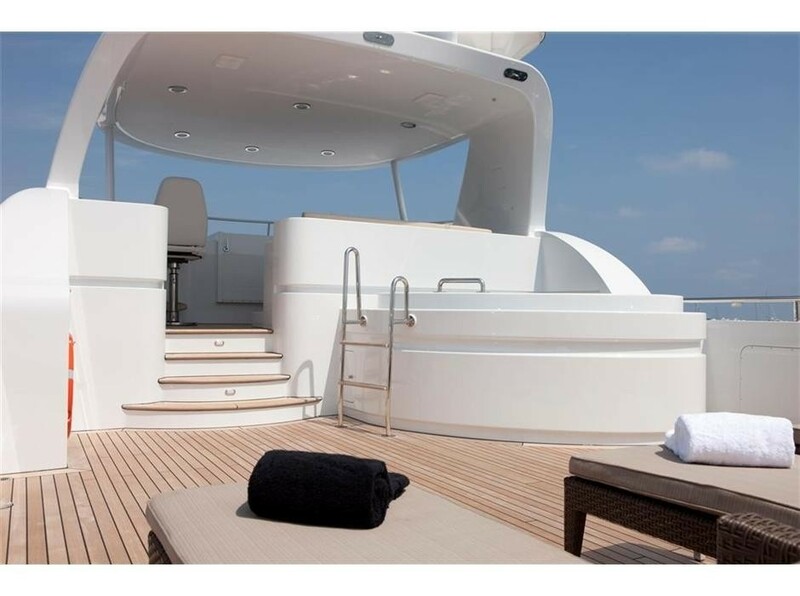 There is also a small tiled Spa Pool and a barbecue. 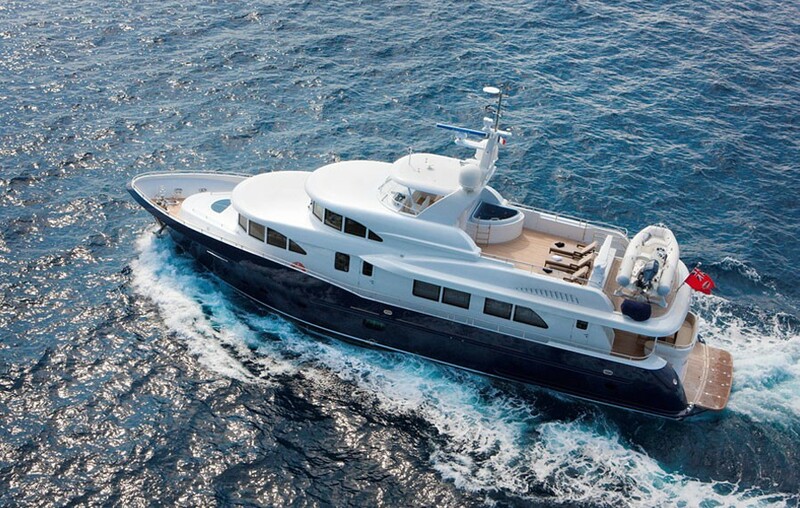 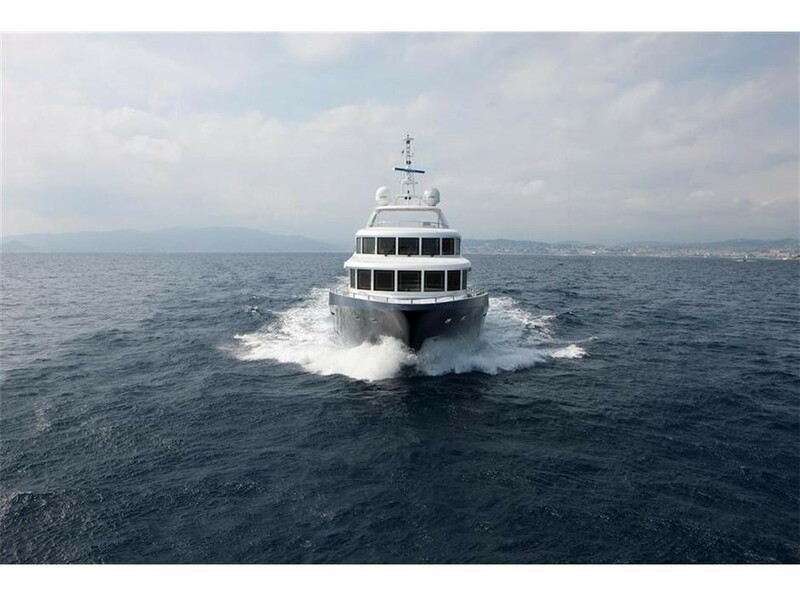 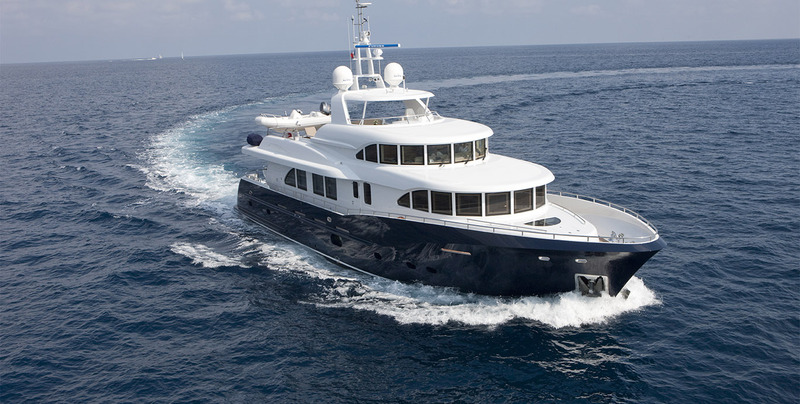 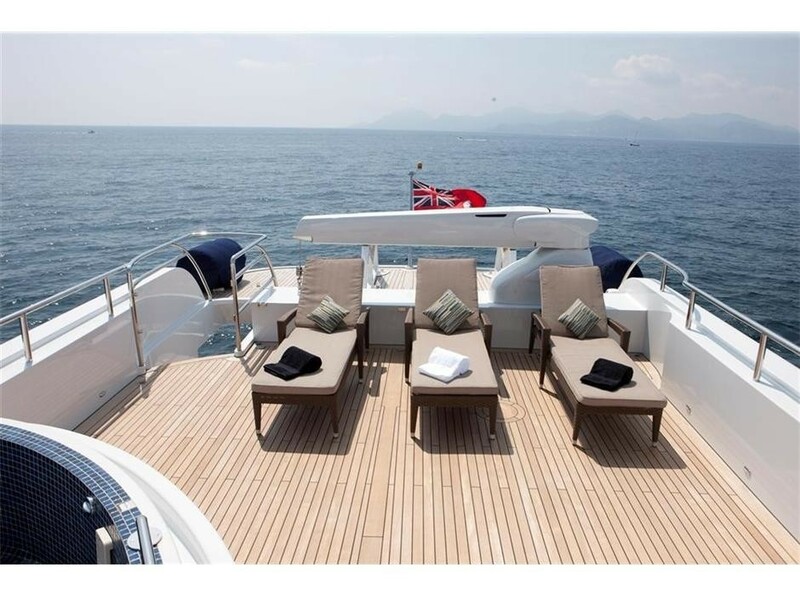 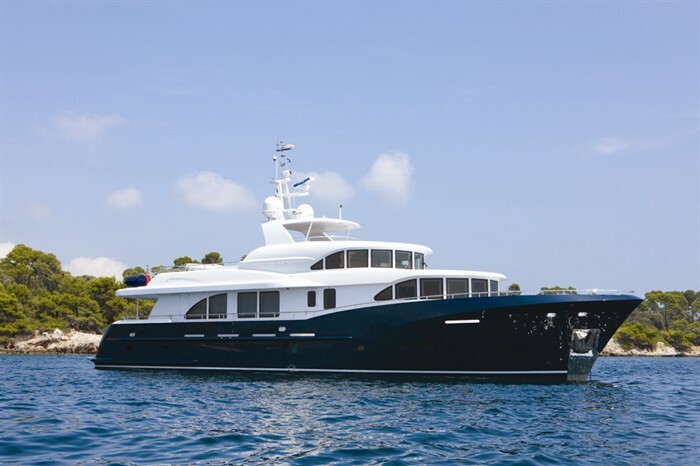 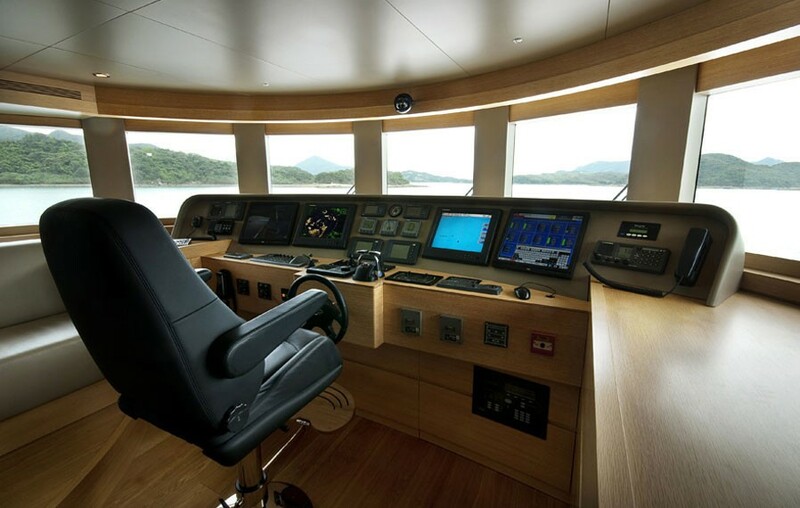 M/Y Belle Isle has a range of 4.500 nautical miles, a cruising speed of 10 knots and a maximum speed of 12 knots. 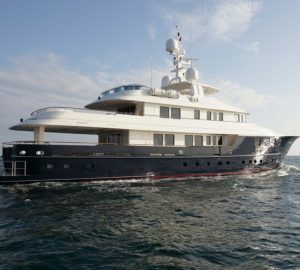 Unusually for her size, she meets the MCA Safety standards as well as Lloyd's classification, adding to her value as a charter yacht. 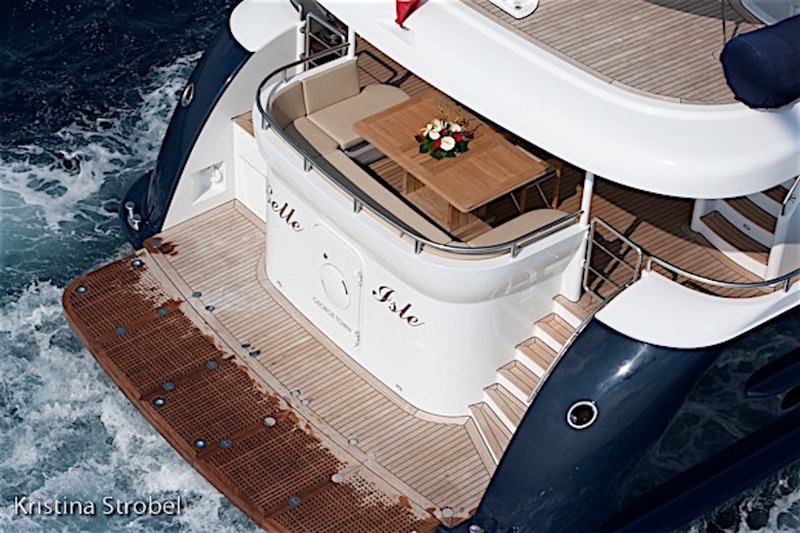 Charter Yacht Belle Isle boasts a very large engine room to house her twin 479-horsepower Caterpillar engines. 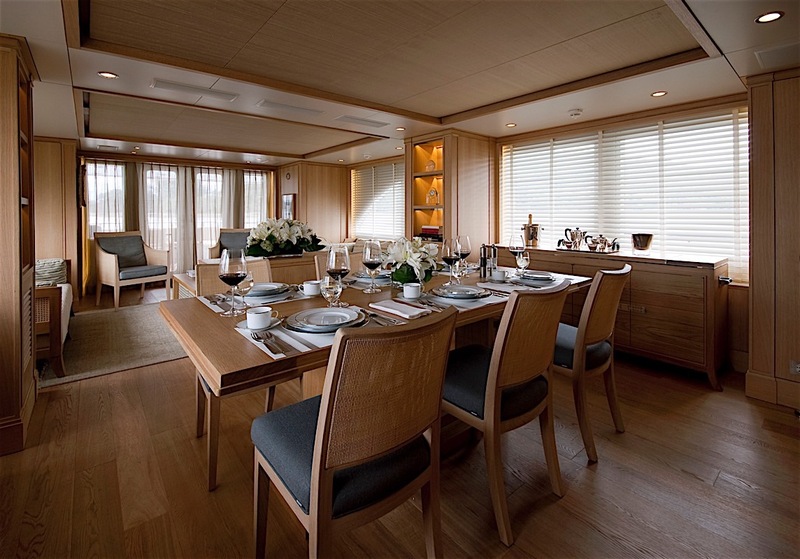 Accommodation aboard Kingship Columbus 90 charter yacht BELLE ISLE is provided in 4 staterooms to a maximum number of 8 guests. 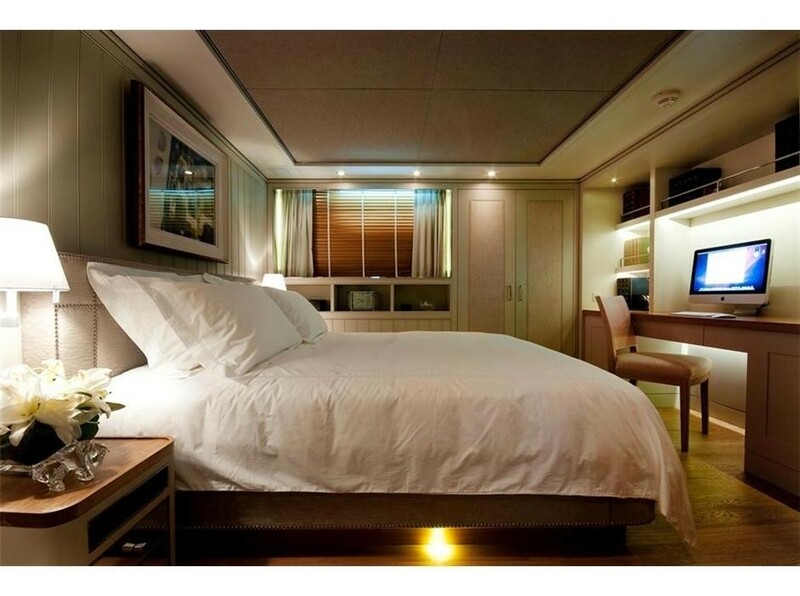 The cabins include one Master Cabin, one VIP cabin and two twin guest cabins. 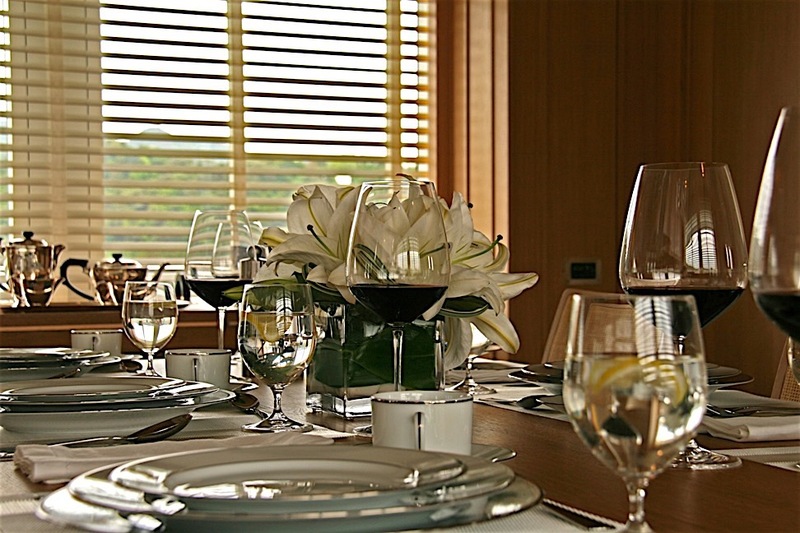 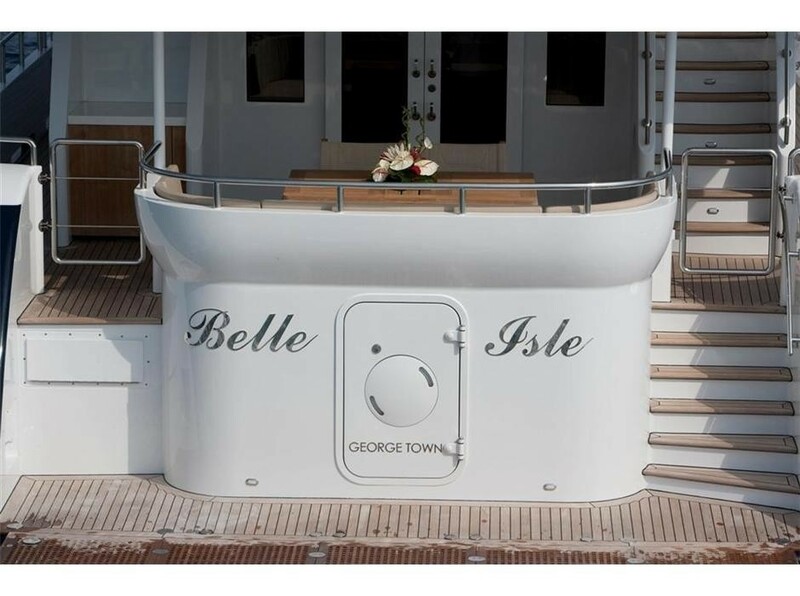 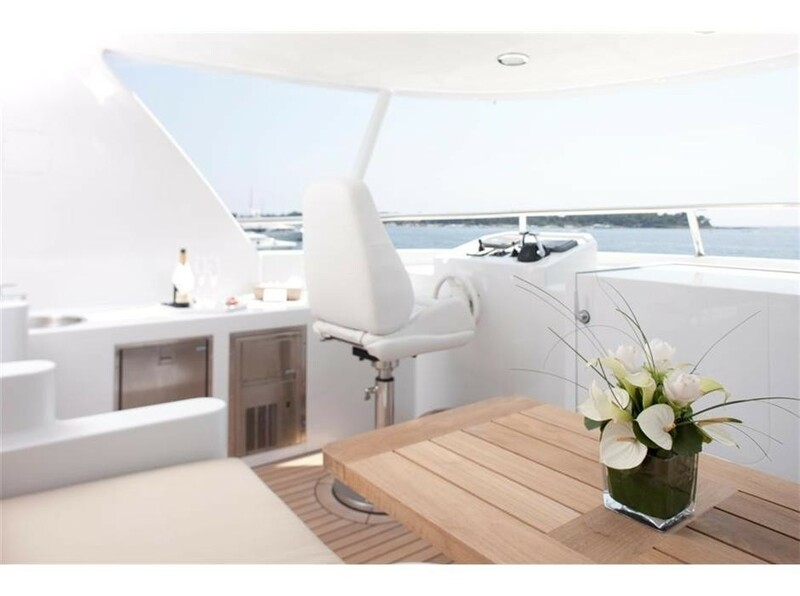 Please contact CharterWorld for a full list of Amenities & Extras that the BELLE ISLE motor yacht offers.